In September 1976, Thin Lizzy’s Phil Lynott and Scott Gorham attended Melody Maker’s annual Readers’ Poll ceremony in order to accept the magazine’s Best Newcomer award. Given that Lizzy had had their first UK Top 10 single [Whiskey In The Jar] three years earlier, and had just finished recording their soon-to-be-released seventh studio album [Johnny The Fox], the accolade rather bemused the two band members, but it reflected the extent to which Lizzy had broken into the national consciousness with that year’s Jailbreak album. The challenge now, for a group whose career had become punctuated with false starts, was to build on this momentum. Lizzy’s manager, Chris O’Donnell, had identified Tony Visconti as the man to push Lynott’s band forward. The New York-born record producer was on a hot streak thanks to his work with T.Rex and David Bowie. And when O’Donnell read an interview in which Visconti had wondered aloud why Thin Lizzy had yet to record an album which matched their live power, the manager reached out to him to see if he might be interested in remedying this situation. 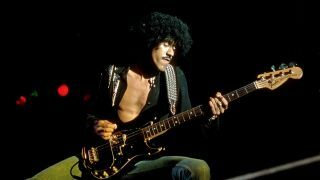 It was agreed that Lynott and Gorham would call in on the producer at his Good Earth studio in Soho, London following the Melody Maker awards, to present a new batch of demos earmarked for Lizzy album number eight. Required to record outside the UK for tax reasons – a by-product of their enhanced ‘rock star’ status – Thin Lizzy arrived at Sounds Interchange Studio in Toronto, Canada in May 1977 on a high following a US arena tour supporting Queen. A jazzy, swinging, finger-snapping tale of teenage romance on the streets of South Dublin, the centrepiece of what became the Bad Reputation album was initially presented to Scott Gorham and drummer Brian Downey as just a simple bass line, Gorham recalls. Despite initial concerns about working without his long-time foil Robertson, Gorham adapted quickly and thrived, his West Coast harmonic sensibilities bringing a lightness of touch to Lynott’s new composition, adding colour and shade without ever threatening to overpower the central bass riff. The producer’s stroke of genius was to bring in Supertramp saxophonist John Helliwell to provide the irresistible melodic counterpoint to Lynott’s breezy vocal. Dropped into radio playlists at the height of punk rock in the summer of ’77, (as a double A-side seven inch backed with the album’s title track), Dancing In The Moonlight carried a twinkling sense of nostalgia, playfulness and innocence gleefully out of step with the times. A Top 20 hit in the UK, Dancing In The Moonlight helped propel its parent album to No.4 in the UK (their highest placing to date) and put them back in the US Top 40. It would become a high point of the band’s live set, immortalised the following year on the magnificent Live And Dangerous album, and remains central to the Thin Lizzy live experience almost four decades on. Although Dancing In The Moonlight is often compared to the work of Bruce Springsteen, its most obvious debt is to Irish soul singer Van Morrison, a long-time hero of Phil Lynott.